Rene Rofe Soft Cotton Camisoles for toddlers and girls provide the perfect barrier between itchy clothing and delicate skin so your child can have the best comfort possible while having fun! 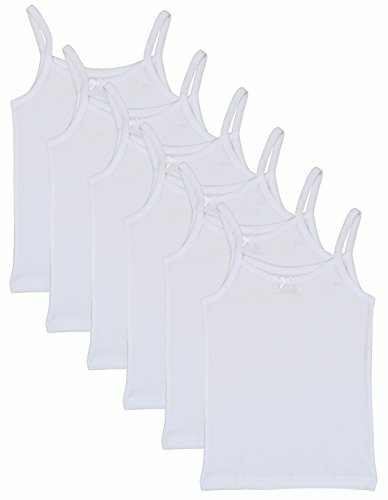 With their fitted design, these white undershirts will not ride up like others. These spaghetti strap tank tops are great for everyday of the week in any season, which makes them Essential for Every Little Girl's Closet! Value Pack 6 soft camisoles come in every affordable package! Cute bow on front; Please reference the variations for all available color and size options! Rene Rofe offers many sizes so every little girl can feel beautiful. Made of premium material, we're sure that your little girl will love these soft camisoles and find them to be an exceptional value! Stop by Our Storefront to See the Rest of Our Great Deals! If you have any questions about this product by Rene Rofe Girl, contact us by completing and submitting the form below. If you are looking for a specif part number, please include it with your message.